We are just about a month away from a critical day of the year. June 24th is the date to pick nuts to make Nocino. 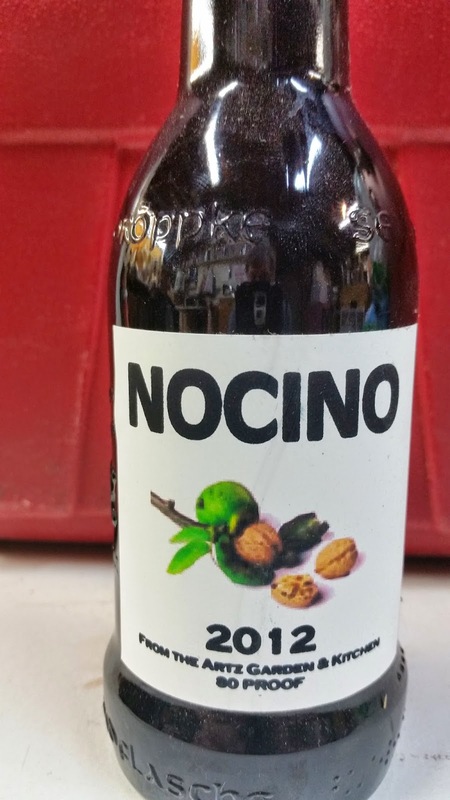 Nocino is a delicious nut liqueur originating from Italy. Many years ago, I learned of it when I heard it referenced on a cooking show. Not long after my initial interest was sparked, I was dispatched on a business trip to Milan. My Italian hosts were eager to show me hospitality, and they kindly offered to take me to a nice dinner. My colleague, upon picking me up at my hotel, was enthusiastic about the fine dinner we were about to enjoy in Milan’s theater district. He asked me what I thought of Milan, and if there was something I wanted to take home with me. I quickly said, “I’d like to buy a nice bottle of Nocino”, since I had recently heard of it and it sounded like something that I would enjoy. He noted this with interest, but said no more about it. Off we went to enjoy a delicious meal of Mediterranean seafood, and a finale that included a tableside grappa cart. Dropping me back at my hotel, my host exclaimed that “Tomorrow is your day. Tomorrow you will not believe what has happened.” OK, I thought, that was interesting. What could it mean? I went to the office in the morning and it was business as usual. My meeting went on until it was lunch time. There was no sign of my friend. After lunch, he barged into our meeting room with a grand flourish and a brown bag clutched in his hand. In the bag was an unlabeled green bottle with a crown cap. Sensing my puzzled look, he exclaimed “It is Nocino, made by my own hand! !” I was shocked and honored; it was, after all “my day.” The Italians in the room were all abuzz, and when I asked what was up, they told me that he never shares the Nocino. Well, I brought that special bottle home with me, and upon the first taste, it was clearly a well-made drink, a luxury item. I should note that I also found some commercial Nocino in Milan, and it was horrible! Over the years, every time I crossed paths with the Nocino maker, he had a bottle for me, and I returned his generosity with a good bottle of Bourbon whiskey. Eventually, and sometimes I can be a bit slow, it dawned on me that I should ask for the recipe and make my own Nocino. I posed the question and suggested that we could then exchange our wares. He loved that idea, and so now Nocino making is an annual tradition. Every year on June 23, we get in touch to make sure the process is underway in two continents. Now you can share in this tradition, too! Start looking for some walnut trees now. 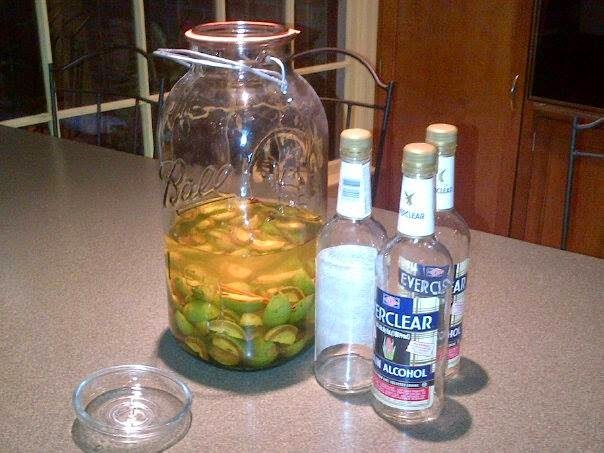 Also work to obtain some grain alcohol; this does not work with vodka. Pick 24 nuts on the 24th of June. I have made this with both English and black walnuts, and both work. I imagine that other nuts could work as well. Wash the nuts with water. Cut each nut into 4 pieces. The nuts are green on the outside, and white and pithy inside. The nut meat will barely have started to form. Place the nuts into 1 liter of grain alcohol in a clear glass jar. Add a finger of cinnamon and a couple (2-3) cloves. I have tried Star Anise as well. Feel free to experiment. 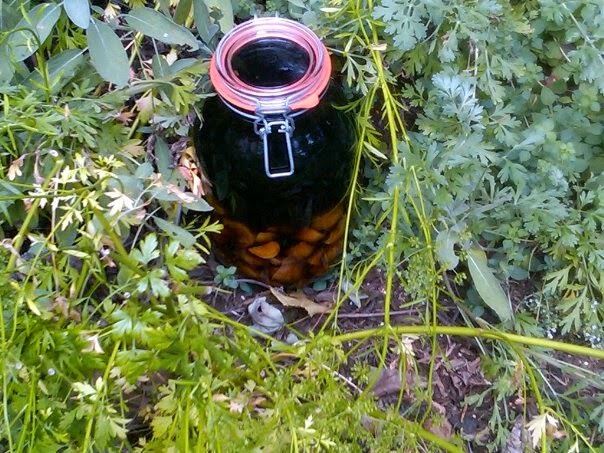 Place the jar in a sunny spot outside. Every so often, turn the jar. The liquid will turn black. Leave the jar in the sunny spot for 40 days. After 40 days, filter the alcohol through a paper coffee filter. Measure the volume of liquid and calculate how much water is needed to dilute to 80 proof (or whatever final proof you want). I made a spreadsheet to compute volumes and proof. For each liter of alcohol you started with, use 800 grams of sugar. Heat the water with the cane sugar (I sometimes use some honey in lieu of some of the sugar, but honey will make the final product sweeter) until sugar is dissolved. Keep open flames away from the alcohol! You can always scale the recipe as desired, too. Nocino is a great after dinner drink. It has a balance of sweetness, bitterness, and subtle spiciness. I have also used Nocino to make a drink I call Liquid Baklava. I made a sack mead flavored with an assortment of raisins and dates, and then infused the mead with Nocino. To me, it is just like drinking baklava. I took a bottle of this on a trip to Italy (Pordenone) to give to my friend. Unfortunately, he could not make it to where I was working, so I shared it around the restaurant where we were having dinner. The Italians asked me where this drink came from, and I told them I made it. They said, “No, this was not made in America, this is Italian.” I guess they liked it.